Tour includes a guided visit of the best collections of the Hermitage. This tour is operated in the afternoon of your ship's second day stay in St. Petersburg and it is also suitable for mobility restricted passengers. After a short drive from the port will bring you to the historical Tsarist Winter Palace complex, which also houses the State Hermitage Museum. The entire complex consists of a total of six separate buildings, all connected to each other along the panoramic River Neva embankment. The buildings are the Winter Palace, the Small Hermitage, the Old Hermitage (also called the Large Hermitage), the New Hermitage, the Hermitage Theater, and the Auxiliary Building. St. Petersburg was founded in 1703, and it soon became the capital of Russia. As the new capital needed a suitable residential palace for the ruling royal family, Tsarina Elizabeth Petrovna (a daughter of Peter the Great) approved the plans of an Italian architect, Bartolomeo Rastrelli, and the construction started in 1754. After eight years the palace was completed, and the first ruler to actually live there was Catherine II (also called Catherine the Great), who moved there in 1763 right after her coronation. After Catherine's death, all the later Tsars of the Romanov Dynasty lived in the Winter Palace until the Russian Revolution in 1917. Catherine II was a modern liberal lady for her times. She instantly ran into a conflict with the conservative Rastrelli since the Baroque style was going out of fashion during the construction, and Catherine favored the new and modern Neoclassicism. The new palace was still empty, so Catherine needed art around her, and she started to purchase entire collections from famous European collectors. However, because her collections did not fit into the Winter Palace, she started adding separate buildings to the palace all along the Neva River embankment: The Old Hermitage (1771), The Small Hermitage (1775), and the Hermitage Theater (1783). They were all built in the new Neoclassical style. Today the museum contains 460 rooms, and about 3 million exhibits. A visitor easily moves from one building to another through inside passages and bridges, as if he would be just touring inside one huge palace. 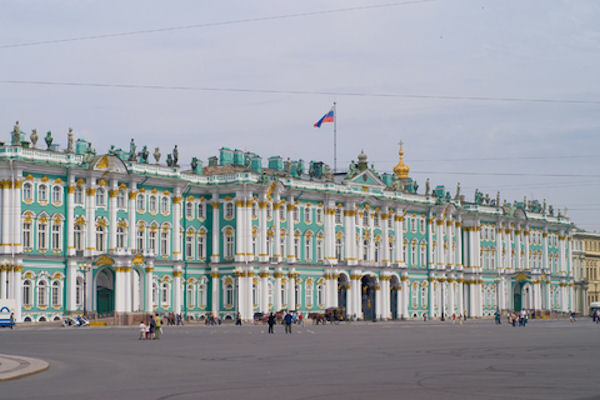 - An inside visit to the State Hermitage Museum. In addition to viewing the unbelievable wealth of the Hermitage art collections. It is impossible to see the entire museum during a visit of a few hours, our guides are well trained to find their way to any part of the palace and to show the most desired collections, productions of specific artists, or art periods. Needless to say, in the Hermitage Museum you can admire the works of such famous artists like Titian, da Vinci, Raphael, Caravaggio, Giordano, Velazquez, El Greco, Rubens, Rembrandt (one of the world's best collections), van Dyck, all the way to Degas, van Gogh, Matisse, Monet, Cezanne, Picasso and others. The north side of the palace faces the Neva River, and the south side has a huge empty square in the shape of a semicircle, called the Palace Square. In the center of the square stands a huge granite pillar called Alexander's Column, which has an angel at the top. Both the Winter Palace and the Palace Square have witnessed many of the decisive historical events and conflicts related to the Russian Revolution, including the "Bloody Sunday" demonstrations and shootings in January 1905, as well as the actual Russian Bolshevik Revolution of 1917.